The United Nations (UN) report calling for a global moratorium on lethal autonomous robotics, weapons systems that can select and kill targets without a human being directly issuing a command, will be considered this week in Geneva. The report is due to be presented to the UN Human Rights Council during the afternoon of Wednesday, May 29 by its author Professor Christof Heyns, the UN Special Rapporteur on extrajudicial, summary or arbitrary executions for the Office of the High Commissioner for Human Rights. The presentation will be followed by a debate where–for the first time-ever in a multilateral forum–governments will provide their views on the question of what to do about fully autonomous weapons. We urge all countries to consider and publicly elaborate their policy on fully autonomous weapons, particularly with respect to ethical, legal, policy, technical, and other concerns that have been raised in the Heyns report. After Professor Heyns presents the report to the Human Rights Council there will be an “interactive dialogue” during which states can make brief (less than 5-minute) statements to provide their views on the report. Campaigners around the world have been urging governments to support the report and implement the recommendations, including in Austria, Canada, Colombia, Germany, Ireland, Italy, Netherlands, New Zealand, Norway, Pakistan, Spain, Sweden, United Kingdom, and the United States. 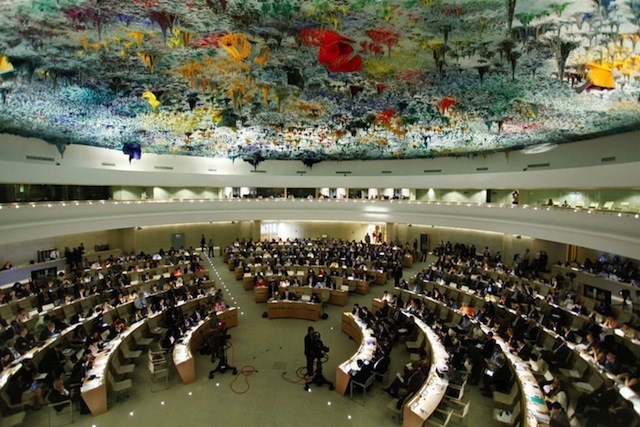 The 22-page report by Professor Heyns, a South African lawyer, has attracted significant media interest and has stimulated public interest since it was uploaded to the Human Rights Council website of the at the end of April. On Tuesday 28 May, representatives of the Campaign to Stop Killer Robots will speak at a midday press conference, and in an afternoon side event, Mr. Steve Goose of Human Rights Watch and Dr. Peter Asaro of the International Committee for Robot Arms Control will present the coalition’s views on the UN report and discuss its expectations for action by governments and others. Report by UN Special Rapporteur Christof Heyns to be presented on 29 May 2013. Synopsis of the UN report prepared by the Campaign to Stop Killer Robots. “United Nations the next stop for killer robots” by the Ministry for Disarmament, 28 April 2013. “Activists, UN put ‘killer robots’ in the crosshairs” by Nidhi Subbaraman, NBC Future Tech, 29 April 2013. “‘The Point of No Return’: Should Robots Be Able to Decide to Kill You On Their Own?” by John Knefel, Rolling Stone, 30 April 2013. “UN report wants moratorium on killer robots” Associated Press, 2 May 2013. “U.N. investigator seeks world moratorium on ‘killer robots'” by Stephanie Nebehay, Reuters, 23 May 2013. “Demand Grows for Global Ban on ‘Killer Robots‘” by Henry Ridgwell, Voice of America, 24 May 2013.